Upcoming elections: "Catholics in politics to build the common good"
Indonesian Bishops' appeal: "choose good candidates"
The Christian Ahok set free, "but his figure polarizes public opinion"
Maumere (Agenzia Fides) - "It is sad and deplorable to see the conditions in which mentally ill people live on the island of Flores", says to Agenzia Fides Father Luigi Galvani, a Camillian missionary who has been working for years on the Indonesian island. "In addition to the enormous physical suffering, psychological difficulties, social isolation and spiritual poverty, these people are forced to live, in most cases, under tents or in shabby huts, chained or with one foot blocked between two large tree trunks and exposed to bad weather conditions, mosquitoes and insects. This is wher they sleep, rest day and night. The local government does not have facilities and a welfare program for them. It merely visits them periodically bringing some medicine". "To concretely support these patients - explains Fr. Luigi - we have carried out a research which revealed thirty cases in the area. Some of these patients had been like this for months, others for a few years and one for forty years". 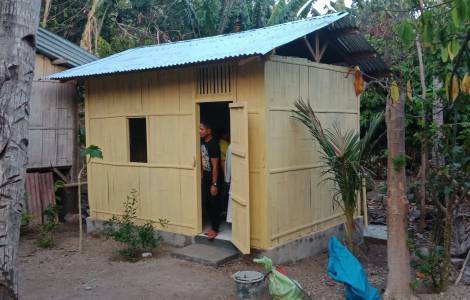 "We thought that the best help we could offer them could have been the construction of "special houses in which they could feel free to move, communicate freely with family members and neighbors" continues Fr. Galvani. "In these shelters – he says - they are protected from rain, wind, insects, they can eat sitting at a table and have a private toilet. A more humane lifestyle certainly favors the healing and rehabilitation process and allows a new integration into the family and social community". "So we started the first houses near the homes of their family members, in order to give them the chance to be followed and cared for by their loved ones. Now many of them seem reborn to new life, they take care of themselves and communicate more serenely with family and neighbors". "This project is truly pioneering", the missionary concludes. The Bishop, Mgr. Edwaldus Martinus Sedu, praised the initiative of the Camillian Missionaries "for their commitment of solidarity and evangelical witness".